I've always been curious why Moroni's explanations of "many other passages of scripture" could not be mentioned in this history. Presumably Joseph and his scribes were short on time. Maybe they intended to provide a more complete explanation of what Moroni said. But I think the main reason why Joseph did not tell us more about what Moroni told him is that Oliver Cowdery had already told us all about it. In Letters IV, V and VI, Oliver gave us the most detailed explanation we have of what Moroni taught Joseph Smith. In Letter IV, Oliver writes, "It is no easy task to describe the appearance of a messenger from the skies... But it may be well to relate the particulars as far as given." Oliver then explains how Moroni quoted 1 Corinthians 1:27-28, portions of Isaiah 28 and 29, the "promises made to the fathers," and more. In Letter V, Oliver explains that "In my last I gave an imperfect description of the angel, and was obliged to do so, for the reason, that my pen would fail to describe an angel in his glory, or the glory of God. I also gave a few sentences which he uttered on the subject of the gathering of Israel, &c." Then he explains that in his next letter, he "will give a further detail of the promises to Israel, hereafter, as rehearsed by the angel." 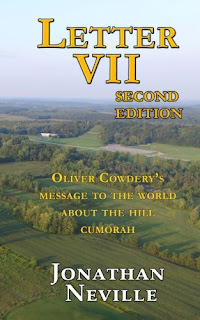 In Letter VI, Oliver fulfills his promise by writing, "I have thought best to give a farther detail of the heavenly message, and if I do not give it in the precise words, shall strictly confine myself to the facts in substance." He then proceeds to quote and explain Isaiah 1, Deuteronomy 32, Psalms 107, Isaiah 2 and 4, Jeremiah 30 and 31, Isaiah 43, Jeremiah 50, Isaiah 11, Jeremiah 2, and more. Among other things, Oliver writes this interesting commentary. It's not clear whether this came from Moroni or Oliver. "And thus shall Israel come: not a dark corner of the earth shall remain unexplored, nor an island of the seas be left without being visited; for as the Lord has removed them into all corners of the earth, he will cause his mercy to be as abundantly manifested in their gathering as his wrath in their dispersion, until they are gathered according to the covenant." After quoting scriptures and commentary, Oliver writes, "I have now given you a rehearsal of what was communicated to our brother, when he was directed to go and obtain the record of the Nephites." In June 1839, when Joseph Smith and his scribes began working on History, 1838-1856, Oliver Cowdery's letters were well known. They had been published in the Messenger and Advocate in 1834-1835. Joseph's scribes had copied them into his own history--the same book that contained History, 1838-1856. I think Joseph wrote his history with Oliver's letters in mind. When he explained the scriptures Moroni quoted, including Malachi, I think he was supplementing Oliver's letters, not supplanting or replacing them. Joseph's history should be read together with Oliver's letters. "I may have missed in arrangement in some instances, but the principle is preserved, and you [he was writing to W.W. Phelps] will be able to bring forward abundance of corroborating scripture upon the subject of the gospel and of the gathering." Once we recognize that Moroni taught Joseph about all the scriptures Oliver included, other aspects of Church history become clearer. Church writers including Phelps, Parley P. Pratt, and Benjamin Winchester were well known for elaborating on the Old Testament passages, but the foundation of their interpretations came from Moroni, who taught these things to Joseph Smith before Joseph even obtained the plates. "You are aware of the fact, that to give a minute rehearsal of a lengthy interview with a heavenly messenger, is very difficult, unless one is assisted immediately with the gift of inspiration. There is another item I wish to notice on the subject of visions. The spirit you know, searches all things, even the deep things of God. When God manifests to his servants those things that are to come, or those which have been, he does it by unfolding them by the power of that Spirit which comprehends all things, always; and so much may be shown and made perfectly plain to the understanding in a short time, that to the world, who are occupied all their life to learn a little, look at the relation of it, and are disposed to call it false." 74 Our minds being now enlightened, we began to have the scriptures laid open to our understandings, and the true meaning and intention of their more mysterious passages revealed unto us in a manner which we never could attain to previously, nor ever before had thought of. "You will understand then, by this, that while those glorious things were being rehearsed, the vision was also opened, so that our brother was permitted to see and understand much more full and perfect than I am able to communicate in writing. I know much may be conveyed to the understanding in writing, and many marvellous truths set forth with the pen, but after all it is but a shadow, compared to an open vision of seeing, hearing and realizing eternal things. And if the fact was known, it would be found, that of all the heavenly communications to the ancients, we have no more in comparison than the alphabet to a quarto vocabulary." I've noticed that some LDS scholars complain about Oliver Cowdery being too verbose and flowery. I disagree. I'm glad he gave us all this additional information about what Moroni told Joseph. There are some interesting details in here that I'll write about when I get a chance. As I've discussed throughout this blog, LDS scholars have largely ignored Letter VII because of the implications for Book of Mormon geography. Some of them still think Oliver didn't know what he was talking about. I think we'll find that as the Mesoamerican nonsense fades into history, more and more LDS scholars will take another look at Oliver's letters. I think we'll discover that it was Moroni who established the foundation for interpreting the Bible to explain the LDS view of the gathering of Israel and other topics.